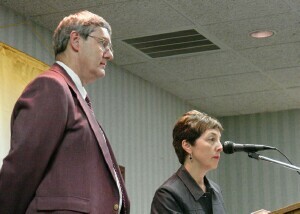 Jeff Rogers and Suzanne Murphy of the Bay City Public Schools explain the Chinese language program at Rotary. PROGRAM THIS WEEK: Mike Asiala, Van Buren Street Theatre. IN MEMORIAM: Bernhard L. Pederson, M.D., died June 1, 2006. 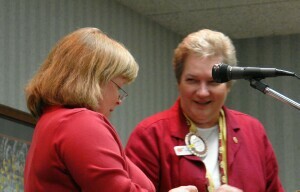 RECOGNITION: Gena Gates, president-elect, Paul Harris Fellow Plus 1, presented by Kathy Czerwinski. PINCONNING ROTARY: Meeting Thursday, June 8, Third Street Deli. Speaker, Harry Farris. New club meets second Thursday. GOLF OUTING: Monday, June 5, Bay City Country Club; 11:30 a.m. registration, 12:30 p.m. shotgun start. WORD OF THE DAY: Shamu, submitted by Sharron Hetzel. Also, Real Darn Good Food Company opens Monday at Third and Saginaw streets. BUILDING BAY COUNTY: The Bay Area Community Foundation -- record assets, grants, scholarships. Congratulations Rotarian Roger Merrifield, staff and board. July 4: Paul Barbeau, Midland baseball club, Dom Monastiere, programmer. LAST WEEK'S PROGRAM: Chinese Language Immersion Program, Bay City Public Schools in cooperation with Michigan State University, presented by Suzanne Murphy and Jeff Rogers. Introduced by Jeff Yantz. At the end of this month Suzanne Murphy leaves for Beijing, China, to learn more about the Chinese Language Immersion Program soon to start in the Bay City Public Schools. Partners in the program are Michigan State University (MSU) and Saginaw Valley State University (SVSU). The most popular languages in the world are Chinese and English, Mrs. Murphy explained in a talk last week to Bay City Rotarians. The difference between the languages is that the Chinese language has symbols, not letters. And 200 million Chinese speak English while only about 40,000 Americans have learned Chinese. Young people can learn 150 Chinese symbols in a year, she said. The goal of the local program is to apply the full Chinese curriculum for language and culture. "We want to make our students global citizens," said Mrs. Murphy. "They need to know the spoken language and understand cultural nuances." Bay City has help from an expert: Dr. Yong Zhao of MSU. The local program will focus on Mandarin Chinese, "the most widely spoken and easily learned," she said. Michigan State will support the curriculum with teachers, cultural artifacts and other aspects of the program, said Mr. Rogers, elementary principal and director of the preschool program. Tuition for the program for 3 1/2 to 5 year olds, that is attracting interest from the tri-county area, is $5,850, also payable on a payment program. "We want to prepare our children to be competitive employees and assets to the community," she commented. One class of 20 youngsters is planned with demand to dictate whether it will be expanded, according toMrs. Murphy. The program may be expanded to the K-12 curriculum, depending on grant funding.